The Jeep Grand Cherokee Trackhawk is a high-performance midsize SUV that competes with the Porsche Cayenne GTS and Lamborghini Urus. With the supercharged 6.2-liter V8 from the Dodge Challenger SRT Hellcat, all-wheel drive and a 3.5-second 0-60 mph time, the Grand Cherokee Trackhawk is not only Jeep’s most expensive vehicle ever, but it’s also one of the fastest SUVs on the market. The 707-horsepower engine was introduced to the Grand Cherokee line for the 2018 model year. For the 2019 model, the drivetrain remains the same but has been fortified to be stronger and more durable over time. The Trackhawk remains as capable as the standard versions of the Grand Cherokee, with standard four-wheel drive and the ability to tow up to 7,200 pounds. The 2019 Grand Cherokee Trackhawk has a starting price of $88,145 including the $1,495 destination fee. The 2018 Grand Cherokee Trackhawk is still on sale and has a starting price of $87,695 including a $1,495 destination charge. The 2019 Jeep Grand Cherokee Trackhawk comes in a single trim. The 2019 Jeep Grand Cherokee Trackhawk has a wheelbase of 114.7 inches, an overall length of 189.8 inches and a width including mirrors of 84.8 inches. The 2019 Jeep Grand Cherokee Trackhawk comes with a supercharged 6.2-liter V8 that has 707 horsepower and 645 pound-feet of torque. The Trackhawk comes with an eight-speed automatic transmission. 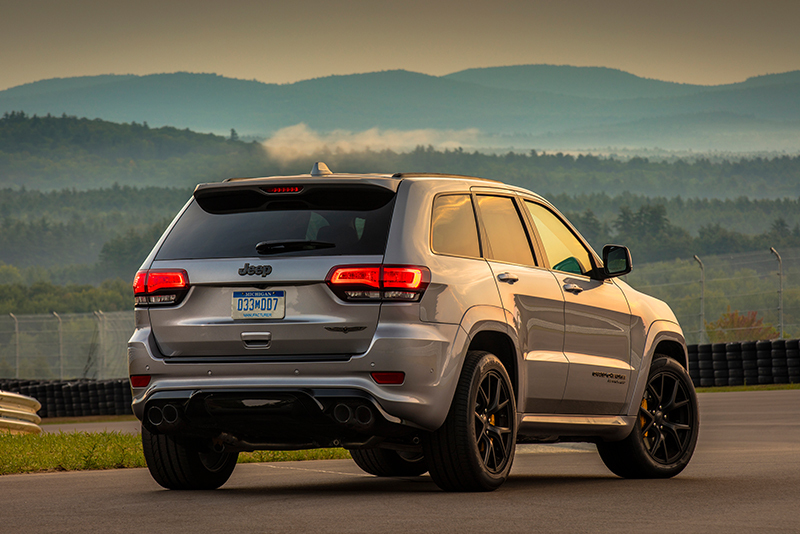 The Grand Cherokee Trackhawk is available only in 4WD configuration. The Grand Cherokee Trackhawk can tow up to 7,200 pounds. The Grand Cherokee Trackhawk has EPA-estimated fuel economy ratings of 11 mpg in city driving, 13 mpg on the highway and 17 mpg combined. The Grand Cherokee Trackhawk comes standard with advanced multistage airbags, blind-spot monitors, hill-start assist, parking-distance monitors, a backup camera, trailer sway control and an anti-theft system. The Trackhawk also comes standard with the Active Safety options group, which includes braking assist, rain-sensing windshield wipers, lane-departure warnings, parallel and perpendicular parking assist, full-speed forward collision warnings, adaptive cruise control and rear cross-traffic alerts. 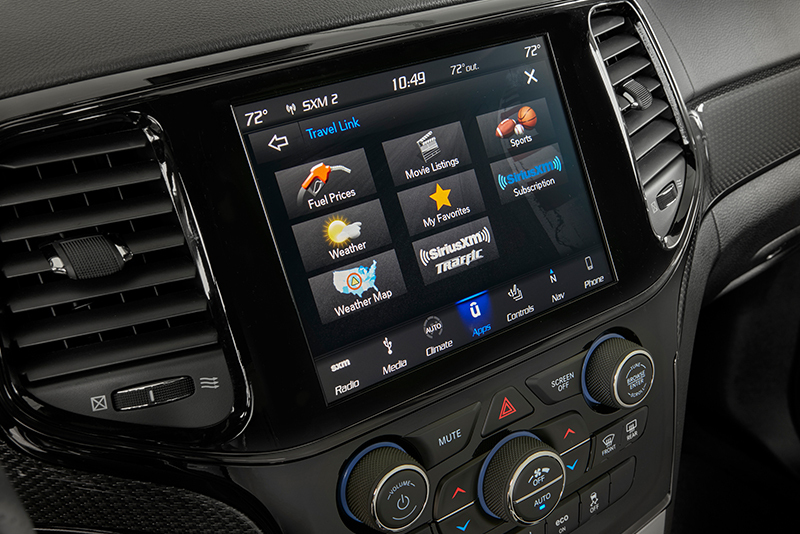 The Grand Cherokee Trackhawk comes with an 8.4-inch screen that includes navigation, SiriusXM radio, Alpine premium nine-speaker audio, SiriusXM Radio, SRT Performance settings and two 12-volt power outlets. Harman Kardon 19-speaker high-performance audio is available. The Grand Cherokee Trackhawk comes standard with an active damping suspension system, bi-xenon high-intensity headlamps, a power liftgate, LED fog lamps, power-folding mirrors, 20-inch forged wheels, Nappa leather and suede performance seats and a leather-wrapped performance steering wheel.